When I was studying at Humboldt University, this library would often come to my rescue: never overcrowded, cool in the summer months and only a few familiar, distracting faces. The Staatliche Bibliothek (short: StaBi) Unter den Linden in Mitte belongs to the biggest ‘universal’ library in Germany and its stylish ’70s vibe makes it a pleasurable place to read, order rare editions or simply observe people come and go. After entering through the impressive, old facade, visitors will be surprised with the clean, modern look of the entrance area. Guided tours are offered for free on every first Saturday of the month, as well as every Friday (more information here). If you’re not only coming for the aesthetics of wood, a lot of orange and contemporary art installations by Olaf Metzel and Tobias Rehberger, with an monthly or annual pass (12 and 30 euro), you get access to every book you can imagine. 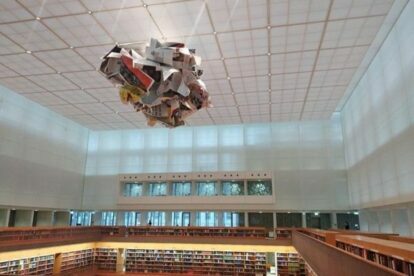 PS: the bigger, less stylish sibling of this library is the StaBi at Potsdamer Straße in Tiergarten. Don’t be mistaken by how many actual books you see in the shelves both here and in Mitte: The principle is to order electronically from the large archive, which remains invisible to the library visitors. Makes it even more exciting, no?